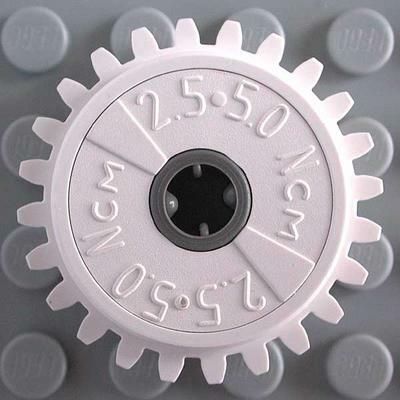 Below you can see how does TECHNIC Gear 24 Tooth Clutch (part 60c01), looks like and works internally. This white 24 tooth spur gear is the Clutch gear. The Clutch gear is special in that the gear teeth are able to rotate about the shaft. It has an internal clutch mechanism that starts to slip when its maximum rated torque is exceeded (see Clutch internals, on right picture from above). The metal plates cause friction in contact with the central rubber element, until a certain applied torque which makes the gear to rotate as an unique piece. When that torque is exceeded, the central slips against the internal metallic plates and gear stops transmitting movement. The Clutch gear is used to limit the torque of a geared system, saving motors and preventing parts from tearing themselves apart, when movement is not possible anymore due to physical constraints or load gets too high. 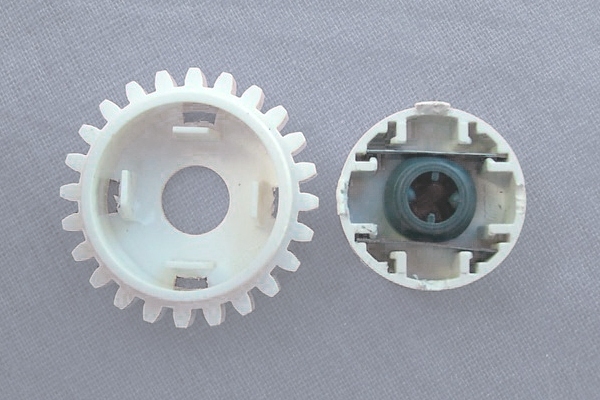 The Clutch gear has 2,5-5 N.cm stamped on its face, which is the torque rating of the Clutch. 'N.cm' stands for Newton x Centimeter, a unit of torque (torque is a product of force and distance, centimeter is a unit of distance, and Newton is a unit of force). The clutch gear can transmit a maximum torque of from 2,5 to 5 Ncm (0,018 to 0,037 ft.lbs or 0,22 to 0,44 in.lbs).